Best Way to Commit Suicide, Eat Shawarma from Kerala!! You read it right, the Arabian delicacy has become a killer in Kerala. Though the unhygienic methods of preparing food items in the hotels isn't a big secret, officials got the wake up call only after a young man died from food poisoning. The 21 year old victim, a hotel management student had consumed shawarma from a hotel in Thiruvananthapuram on the way to Bangalore.Next day he fell ill and was later found dead. Two of his friends where hospitalised following severe food poisoning. As customary, the incident caused a lot of stir in the media and among the people. The incident became the topic of discussions and debates. Everywhere in Kerala, startled people where seen discussing the matter in the, 'I knew this would happen one day' tone. My mom wasn't far behind. She gave me one hour lecture daily on my habbit of skipping meals at home and eating from outside. Anyway, Food Safety Wing decided to take notice atlast and declared a one week ban on shawarma in Ernakulam District. A chain of frenzied raids began with Food Safety Officers marching into hotels all over Kerala. The next shock wave came with the startling discovery made by the Food Safety Department. Many of the hotels were functioning under highly unhygienic conditions. In one of the hotels, there was a toilet right in the kitchen and the whole kitchen was stinking with the smell of latrine. Many of the kitchens where filthy and the food materials where stale. Coloured food grains, unwashed utensils, meat with worms in it, excessive use of tastemakers including aginomoto.. the list of things found out by the Officials is horrifyingly long. Many hotels where shut down and many more where given notice to improve their condition within 14 days. If you thought all this was happening only in the small and medium scale hotels, you are wrong. Stale food was found in many of the star hotels too. Ironically, the officer who conducted the raids in star hotels, was given transfer the very next day. So much for responsibility and honesty! Several actions were taken by the Food Safety Department to curb this issue.The Food Safety Commissioner called in the hotel owners for a meeting (which turned out to be a shouting match) and reminded them that the deadline for restaurants to obtain licence under the Food Safety and Standard Act 2011 was nearing and that strict actions would be taken against those who fail to obtain licence by then..Authorities also warned people from eating street food and said that they will not allow Shawarma counters to sell food made in the open without any protective covering . Things dint stop there. It was now turn of hoteliers to protest. The Hotel Owner's Association protested against the raids by shutting down all the hotels for one day. The drama has ended for now.. Every one has gone back to their normal lives. The shawarma incident and the unhygienic condition of the hotels is slowly fading from the memory of people!Hope it doesn't fade away from the memory of the Officials. Routine checks by officials and enforcing the law strictly could have saved one life. At least from now on, I hope such incidents are prevented and that hotel owner's learn the seriousness of the issue and ensure that quality of food isn't compromised. This is the first guest post here. Yeyy!! Cheers to Stephanie Fisher from Closet-13 for her beautiful post. This is written as a part of the Blog Swap organized by 20 Something Blogger. The topic was 'Childhood Summer Vacations' and you can read my post for it here. Most of my childhood summer vacations were spent in cottages in the English countryside, however in 2003 we went to Spain for 2 weeks. I was so excited to be going abroad for the summer. We visited Costa Blanca, which is along the south east of the country. 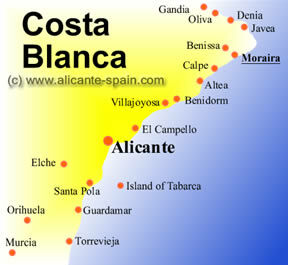 We arrived at Alicante Airport and hired a car to take us to our villa (called Casa Nina) in Moraira. We were loaned a silver Renault Clio which was nice and small, but unfortunately wasn’t very reliable as it kept breaking down (we found out later that the heat was evaporating the petrol!) 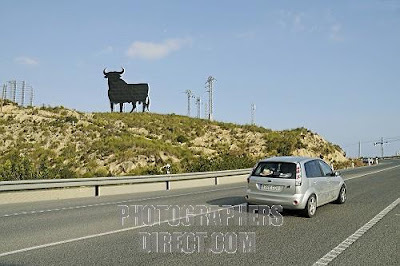 The weather was beautiful and the journey showed us some of the amazing views of Spain. We passed Benidorm, which was huge and very busy, and a giant black bull in the mountains along the roadside. In the evenings we were able to walk around the area and explore the town, as it wasn’t too hot. The number of restaurants there were along the sea front astounded us. There was such a wide variety that we were able to have something different to eat every night, including pizza, Chinese food and even fish and chips. We eventually managed to find an English restaurant with air conditioning and we returned here every so often when we got too hot in our villa! over 101oF/39oC in England and so it was even hotter for us in Spain! We had no air conditioning and there was not a single fan for sale in the country. Every single shop had sold out. So, most nights were spent, windows open, sitting in front of the freezer with cold drinks and ice cubes, trying to cool down. One night we found a street market (we learned that most shops and markets open in the evening to avoid the heat of the daytime). It was filled with people selling handmade crafts and gorgeous materials. I bought all my friends handmade bracelets and bought myself a necklace. 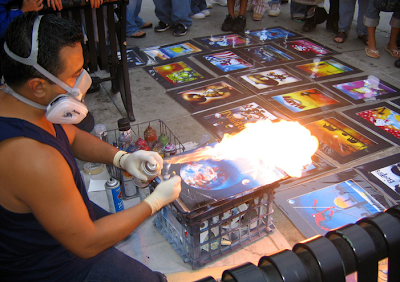 The most impressive display however, was a man who made and sold amazing pictures with spray paints. We had never seen anything like this before and were so fascinated by him that we watched him for hours until we decided to buy one. He finished each picture by ‘sealing’ it with heat, creating a giant flame with a lighter and an aerosol can. It was a wonderful holiday and although at first I wanted to come home because it was so hot, by the end of the two weeks, I didn’t want to leave! I would definitely go back to the area again as it was a great experience.